The Memory Expert At The Bridge Table and Fuggeddaboutit: A pair of blockbuster memory demonstrations that will make you look like... uh, what's his name. In addition, there are thoughts on effect construction, the presentation of gambling material and even some left-handed card moves. 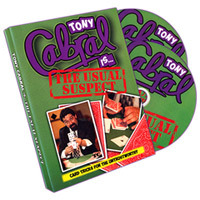 Not for the beginner, or anyone who wants to keep getting invited over for poker nights, Tony Cabral: The Usual Suspect is definitely for lovers of strong card magic.